The data is collected from only 12-15 U.S. trade publishers. This means it dramatically understates what's really happening in ebooks, because thousands of large and small publishers, as well as tens of thousands of independent authors, aren't reporting their data. The data also doesn't capture ebooks sold outside traditional retail channels. The above omissions in no way invalidate the data, because as an indicator of direction and momentum, the AAP/IDPF data provides the best publicly available trending information I'm aware of. 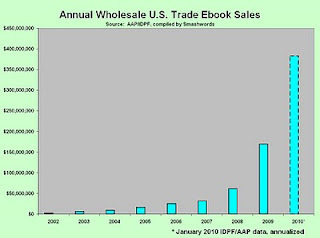 According to the AAP, in 2009 ebooks accounted for 3.31% of all trade book sales, up from only 1.19% in 2008. Even if sales stay flat from January onward in 2010, we're looking at ebooks accounting for 6-8% of U.S. book sales in 2010. If sales accelerate further, a 10% monthly run rate is certainly likely by the end of this year. These numbers are dramatically higher than most reasonably-minded industry watchers predicted even a few months ago. The rosy numbers above still dramatically underestimate the impact ebooks are having on the bottom line of authors, publishers and retailers. In January, during Amazon's quarterly earnings conference call, Jeff Bezos announced that for books it sells in both Kindle and print formats, ebooks were then accounting for 60% of unit sales. What's driving the torrid growth of the U.S. ebook market? The upcoming April 3 launch of Apple's iPad, along with more aggressive moves by Google, Barnes & Noble, Sony and scores of other new ebook device makers and indie retailers, will no doubt try to chip away at Amazon's purported 90% share. The real story is not how or if these competitors take share from Amazon. It doesn't matter. What matters is that an ever-growing pro-ebook crowd of powerful consumer-facing companies are pulling out all the stops to help spread the joy of ebooks to every corner of this book-hungry globe. If we boil it all down to what really matters, it's about customer experience. People who try ebooks are loving ebooks. Lest we think ebook reading is all about pricey jet set devices like the iPad, Kindle, Sony Reader and B&N nook, it's worth considering some telling data that came out of the latest Book Industry Study Group survey. As I reported in my Tools of Change conference wrap-up, BISG found that 47% of all ebook reading is happening not on these new-fangled devices, but on ordinary computer screens. Mark - I'm excited by the momentum that's gathering, and no doubt the interest generated by the IPAD - and the rival products to follow - will continue to drive the exponential growth you're reporting. Modestly, you didn't mention Smashwords' role in this. So let me. By providing an easy-to-use, device-agnostic, non-restrictive e-publishing platform, you've given thousands of writers control over their output. And that's released a torrent of new writing. I hear complaints that without gatekeepers, there's no assurance of quality. But this underestimates readers' ability to discriminate and find their favourite niches. Clearly, they're finding value in writing which previously might not have made it out of the slush pile. So all credit to you, and thank you for giving many of us the opportunity to shape our writing careers. And perhaps something else you could add to your list of reasons for the ebook's popularity. Now as never before, reading is an interactive experience. We communicate with each other, reader and writer, and on both sides it enhances our enjoyment. Just like this. Thank you for this spot-on comment, Alan. I tip my hat to you. You get it. Indie authors get it. The days of the gatekeeping publisher filtering books for readers are over. Authors and readers can now connect on their own terms. Authors can be their own publishers. What a concept - publishers and authors desiring a relationship with the customer. Successful indie authors understand this secret, and fans of indie authors show their appreciation. Write on. I thought I would add some personal data to the big picture numbers. In 2008, about 10% of my sales were ebook. By the end of 2009, ebook sales had grown to over 23.2%, with heavy December purchases driving up the annual figure. Since January 1 of this year, my ebook sales have been 42% of total sales. At first I thought it was people loading up their Christmas ebook readers and depleting gift cards, but this is late March and the trend is holding steady. Thanks for sharing your results, James. I think this shift is catching everyone by surprise. www.discountaudiobooks.com learned from audible.com, acquired by Amazon, the great potential of ebooks. Alan's point about "no gatekeepers" is interestingly dealt with on Rasmussen Polls. The public has MORE faith in the lack of bias by non-traditional recommendations than those by recognized pundits (i.e., NYT, WSJ, etc). If you make an ebook mistake, it was just a couple of bucks anyway. Kindle lets you take a dabble for free, as does audible.com with a single track. The publishing companies in NYC will be like Ozmandius in Shelley. Alan also addresses the feedback. If we make a "mistake" in an ebook, and are blessed with a reader who lets us know, we can fix the ebook and get it republished in 48 hours. Feedback becomes a blessing not an upsetting moment when you have to wait for the next edition, if there is one. Liberation. Almost like the Boston Tea Party. Power to the reader and the people. Gatekeepers no longer matter as much, except as recommenders which Smashwords does so well. Thank you for it. Hope the trend continues, I've published two books with Smashwords this month. Delighted with your site. Thank you. If I upload my ebook to Smashwords, how often does Smashwords upload 'new arrivals' so to speak to itunes and the like? When it comes to quality, readers are the new gatekeepers. You can show 50% of your book for free on Smashwords. If your readers like it, they will pay for the other half. If they don't, they won't. It's that simple. Print publishing simply cannot compete with this kind of innovation.